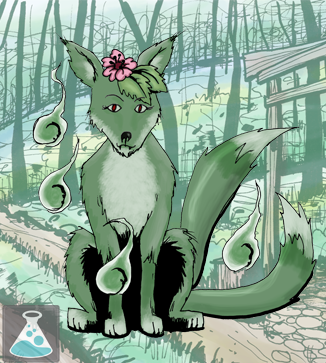 The Forest Kitsune is a two-tailed Kitsune with leafy-green fur and floral hair clip who dwells in the Wilderness Realm. His personality can be rough around the edges and he tends to exude impatience though, deep down, he is generally caring and nurturing. This sentiment tends to be disguised under a somewhat brash, and at times abrasive, exterior - probably a result of his young age as a Kitsune. This Kitsune pulls strength from various flora in his close vicinity; his efforts are most effective when pulling this power from thick forested regions. His specialized abilities lie in the realm of influencing and manipulating the growth or movement of these plants and vegetation, as well as a modest ability in assisting recovery and augmentation of other biological beings. Not many humans see this particular Kitsune in their world, though he spends a large portion of time there. The Forest Kitsune enjoys creating his own gardens of these terran forests; the humans’ sylvan regions are unique to the Kitsune, as they do not exist in the Kitsune Domain.